It gives me immense pleasure to be here, in your midst, once again in Nagaland on such an auspicious day. 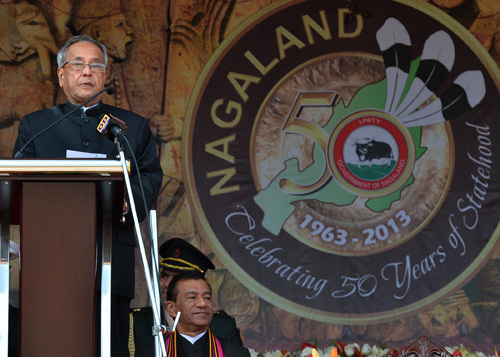 At the outset, let me congratulate the people and Government of Nagaland on their completion of 50 years as a state. I also compliment them on having organized this Hornbill Festival 2013 which brings together all Naga tribes in a collaborative effort to preserve, protect and provide new impetus to their rich traditions of music, dance, food and culture. I am happy to release on this joyous occasion a commemorative Stamp of Nagaland and a coffee table book. I was here in May of this year on my maiden visit as President and am back within a short period of seven months. This is evidence of both my fondness for this state and its wonderful people as well as the importance I attach to the progress and development of this state. Fifty years ago, on this very day, my predecessor Dr. S. Radhakrishnan while inaugurating this State called upon the Government to capture the hearts and minds of the people. He said leaders must exercise a human and healing touch in their relations with the people so that they are not deprived of their innocent joys, songs and dances, and feasts and festivals. I am delighted to note his message being implemented through this Festival and would urge the leadership to continue to heed this advice. The traditions and practices of the Naga people are rich and unique. I would like to use this occasion to call upon the people of the rest of India to discover Nagaland, visit this state, contribute to the local economy and strengthen the bonds that tie different parts of our country and people together. Nagaland has come a long way since attaining statehood. Its achievements in human development and industrial growth are praiseworthy. Yet, there remains much to be done. In a modern globalised world, the expectations of our people are high. There is need for infrastructure and connectivity. Youth should have jobs. There should be visible improvement in the quality of life. Development should be inclusive, equitable and sustainable. We live today in a world which is undergoing rapid change, propelled by revolutionary changes in information and communication technology. Nations and economies have never been as closely linked with each other as they are today. Distance and nationality are no longer restraining factors in a technology driven ‘flat ‘world. Unprecedented opportunities exist for the people of this state and our country in these changing times. Education and infrastructure are the keys which will enable the people of Nagaland seize these opportunities. Raising Nagaland to the ranks of leading states in the country is a goal which can be achieved if there is vision, leadership and hard work. The Central and state governments must join hands in a collective endeavour supported by all the people of the state and dedicate themselves to the attainment of this goal. It is impossible to achieve development in the absence of peace and security. I urge all concerned to work towards establishing and maintaining a peaceful environment in the state so that the dreams of the youth can be realized in the shortest possible time. In the 16 months since I assumed office, I have visited Assam thrice, Nagaland twice, Sikkim twice and Manipur, Meghalaya, Tripura and Arunachal Pradesh. Only Mizoram remains and I look forward to an early occasion to visit the state soon. My frequent visits to this region reflect its strategic importance and the role it can play in the building of a strong and powerful India. Considering the quality of its human resources and its natural resources, the North East of India has tremendous potential to achieve rapid, inclusive and sustainable growth. This region can become a magnet for major investments from the rest of the country as well as abroad. It can turn itself into a major centre for trade and business. This region constitutes one of India’s most important opportunities of the future and it must be given the utmost importance and attention by our political leaders, policy makers, administrators and all other stakeholders.. The north east of India shares borders with five countries and is a natural bridge between India and South East Asia. The essential philosophy of India’s ‘Look East’ foreign policy, is that India must find its destiny by linking itself more and more with its Asian partners and the rest of the world. India's future and economic interests are best served by closer integration with rest of Asia. The states of the north east should lead in making our neighbours partners in our development and harnessing the opportunities that are emerging from the rise of Asia and India’s growing economic integration with the region. The Centre and State Governments should work together to rapidly build connectivity and infrastructure linkages with the rest of India as well as our neighbours. India is making determined progress in every field of activity - be it business, industry, trade, education or culture. A billion people are marching forward led by the ideas, enterprise and energy of its predominantly young population. I am confident that India will soon emerge as a strong and powerful nation, our economy will continue to witness rapid growth and people will enjoy a high quality of life as well as freedom, justice and equality. The people of Nagaland and the rest of our nation have a shared destiny. Nagaland must take its due place in our great country. I call upon the people of Nagaland to reach out to the other states. It is heartening to note many youth from this region being engaged in hospitality and information technology sectors and working in different parts of the country. I call upon the youth of Nagaland to join hands with the young in the rest of our country and together forge the future of our nation. Let the dark days of violence and conflict be left far behind. Let a new dawn emerge. Let us together move forward with faith in our common destiny. The Government of India is determined and duty bound to ensure that every Naga lives with dignity having equal rights and equal opportunities. Let Nagaland lead the way in the building a new future for India. Let it set an example to the rest of India and show how the entire region can be transformed into an area of peace, stability and prosperity. With these words, I conclude. I thank you for inviting me to your State. I once again compliment all of you on the fiftieth anniversary of Nagaland Statehood and wish you happy Hornbill Festival.